It is a rainy blustery day and Ebb is bored. Everyone else is busy and they don’t seem to have any time to play with Ebb. As Ebb looks out of the window and listens to the storm outside, she hears a noise. As quickly as possible Ebb goes outside to see who is out there and she finds a baby seal on the beach; a baby seal moreover who is delighted to have a new playmate. 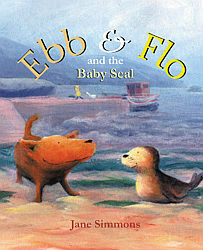 Together Ebb and the baby seal have a wonderful time playing but as the day comes to a close and Ebb prepares to go home, Ebb comes to realize that the baby seal seems to be lost and it doesn’t know where its home is. Clearly the seal needs some help and Ebb is determined to do whatever she can. This charming picture book is warm and comforting. If only we all had an Ebb in our lives to help us find our way home when we get lost. Children will quickly identify with the characters in this well crafted and attractive picture book.